The seminar was moderated by Mr Anders Bergström, Coordinator of PA Education from the Norden Association. 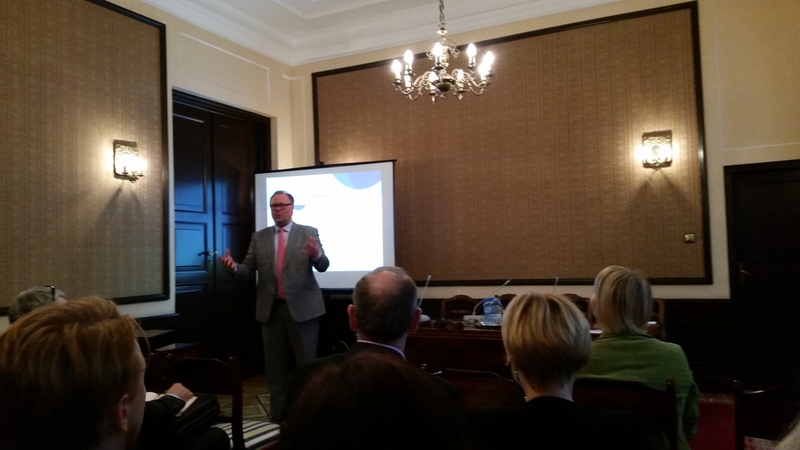 On 18th November 2014 in Warsaw Euroregion Baltic took part in a seminar dedicated to cooperation within the Priority Area Education of the EU Strategy for the Baltic Sea Region. Moderated by Mr Anders Bergström, PA’s Coordinator from the Norden Association, the seminar was organised by the EUSBSR National Contact Point at the Polish Ministry of Foreign Affairs. With around 60 participants from various ministries, educational institutions, labour offices and non-governmental organisations, the meeting attempted to shed more light on the details of transnational cooperation on higher education with special focus on vocational training, labour market issues and youth employment. During the presentations several active and potential Flagship Projects within EUSBSR were introduced by their representatives. These included such projects as Baltic University Programme, Baltic Training Programme, South Baltic Training Programme, HansaECVET, Baltic Sea Labour Forum, Ready to Research, Introducing Dual Education in the BSR, Baltic Sea Labour Forum mobility initiative, BSR Life Long Learning, Quick IGA, Baltic Science Network and EntrepreneurshipLab. Among them was also SYPERB Strategic Youth Policy in EuroregionBaltic project which was introduced as a new initiative that could later become a Flagship Project within the Strategy. The seminar proved to be very informative and well organised, allowing participants to gain more concrete and practical knowledge on the implementation of the Strategy and meet relevant stakeholders working within the Priority Area. For more information about the Seminar including all presentations, please follow this link to an article in the official web portal of the Polish Ministry of Foreign Affairs on the country’s involvement in the EU cooperation.